Spanish Edition Also Available A read-aloud storybook retells the classic tale of Tarzan, an orphaned boy raised by apes in the jungle who is forced to choose between his family ties and his destiny as a human. 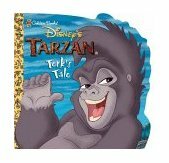 (Book Plus Audio Cassette AND CD) Tarzan may seem like the kind of story you'd sell to an entertainment-starved kid apt to leap around in a loincloth or swing from the chandelier, but Disney's retelling extends a vine to the tamest 5- to 10-year-old. Take away the ferocious leopard, an angry ape or two, and a bounty-hunting bad guy, and you're left with a love story: Tarzan (voiced by Tony Goldwyn), orphaned in the jungle, is adopted by apes Kerchak (Lance Henriksen) and Kala (Glenn Close). As he comes of age, simian siblings Terk (Rosie O'Donnell) and Tantor (Wayne Knight) school him in the ways of the savages, so that when Jane (Minnie Driver) arrives with her father (Nigel Hawthorne) and their jungle guide (Brian Blessed) on an expedition, she's bewildered by his beastliness. But she also finds him kind of cute. Cut to a couple of human, baboon, and gorilla chases, gunshots from a human who turns out to be more savage than the savages, and a storybook ending for the sweethearts, and this becomes rope-'em-in, sweep-'em-along, snip-off-the-loose-ends Disney escapism, the kind you can set your clock by. Or, in this case, your computer. Besides the booklet and tape combo, the tidily packaged Tarzan Read-Along houses a CD you can substitute for the cassette or slip into your CD-ROM drive. The story plays onscreen as the words scroll by beneath. The cast's talent, the animation, and the classic jungle-man yodel-yelp combine to pull young readers in by the pith helmet--in tackling Tarzan, Disney didn't monkey around. By Eric Suben This is a retelling of Disney's new blockbuster animated film Tarzan, the classic story of the orphaned human baby adopted by apes in the African jungle. Tarzan grows up in the jungle with the gorillas. He learns the ways of the jungle, but always feels different, somehow. When he meets others of his kind: Professor Porter, his daughter Jane, and Clayton, the hunter, he realizes that there are others in the world like him. The humans convince Tarzan to let them meet his gorilla family, but then he must protect his family from the evil machinations of the human Clayton. Then he and Jane can live in peace and happiness in the jungle. By Eric Suben Terk is not too happy about his “hairless wonder” of a cousin Tarzan hanging around. Find out how their wacky jungle adventures taught them to be best buddies. By Jennifer Liberts Simba, Tarzan, Mowgli, and all their jungle friends know how to have a swinging good time. Children will love hearing the fun rhyming poems about the stars of The Lion King, Tarzan, and The Jungle Book. Travel along with Disney's Feature Animation team through the four-year journey it took to create Disney's newest animated feature, Tarzan. With this special collector's edition you can experience the saga from the initial concept-art stages to finished film stills. Packed with photos, interviews with the actors who provided the film's well-known voices, and a read-aloud retelling of the story, the book allows fans of all ages to experience the magic again and again. By Ellen Milnes Has cute, warm, Disney-ish cartoons and a simple story you can play along with. Each left page has a word in large type, like "HORN" or "BELL", and the corresponding right page shows the sounds being made, like "Click" or "ding-ding". The book begins with just one sound, and each page adds a sound, so that by the end of the book the gang is engaged in a real jungle jam of sounds strung together using household items. You can read it with gusto, putting your all into the "blat blat" and "thunk thunk". You can even gather props and bang things while you read. A cute book for little ones of various ages. The grownups get to have fun too. By Justine Korman This is a retelling of Disney's new blockbuster animated film Tarzan, the classic story of the orphaned human baby adopted by apes in the African jungle. Tarzan knows that he doesn't look like his ape family or really fit in, but he adapt s and becomes one of them. One day, a study team comprised of the hunter Clayton, the kindly Professor Porter , and his daughter Jane, arrive; Tarzan meets his first humans and realizes that he is one of them. Tarzan and Jane fall in love and Tarzan is torn between the family who raised him and the possibility of a new life. When Clayton betrays Tarzan's trust and kidnaps the apes, Tarzan saves them and his fateful choice is made. Wonderful characters and delightful humor combine with the story's universal message about love and loyalty to make this one of Disney's best productions yet. (Coloring Book) Keep your child entertained for hours after the movie ends with this fun and exciting 192-page Jumbo coloring book. Featuring artwork from the most exciting scenes in this blockbuster film. 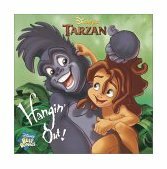 (Coloring Book) Head into the jungle and hang out with Tarzan, Terk, Tantor, Jane, and the other stars of Disney's Tarzan. They are all featured in exciting coloring pages and fun puzzles and activities. By Judy Katschke Terk, Tantor, and Tarzan challenge the rest of the jungle animals to a banana-picking contest. Tarzan is determined to prove that he can compete with the best of the jungle animals. His success contains an unexpected surprise. Spanish Edition Also Available Tarzan and his friends explore the jungle world of animals, sounds, and matching pairs. Over 50 flaps to lift and play with. By Liane Onish A beautiful book for anyone who loved the movie's dynamic animation sequences. It has two sides both showing Tarzan gracefully flying through the trees using actual cells from the movie. It's really neat to flip through. It's like having part of the movie to take home. By Kathleen W. Zoehfeld This is a retelling of Disney's new blockbuster animated film Tarzan, the classic story of the orphaned human baby adopted by apes in the African jungle. Tarzan grows up in the jungle with the gorillas. He learns the ways of the jungle, but always feels different, somehow. When he meets others of his kind: Professor Porter, his daughter Jane, and Clayton, the hunter, he realizes that there are others in the world like him. The humans convince Tarzan to let them meet his gorilla family, but then he must protect his family from the evil machinations of the human Clayton. Then he and Jane can live in peace and happiness in the jungle. How to Draw Disney's Tarzan Disney has brought the famous Edgar Rice Burroughs story of Tarzan back to the big screen in an action-packed film that breaks new ground in animation--and now you can learn to draw this larger-than-life hero! In this exciting new How to Draw book, you’ll learn the secrets Disney artists employed to bring all the characters of Tarzan to life. In just a few simple steps, you’ll be able to recreate Tarzan, Terk, Tantor, and Jane--and all of Tarzan’s animal and human friends and foes in the steamy jungle. So what are you waiting for? Grab a pencil and start drawing! Swing Time Disney's exciting story of Tarzan, the human raised by apes, is re- told in this 84-page coloring and activity book. There are movie scenes to color and jungle activities and games to play. Always in My Heart with Easy-Peel Sticker Tarzan follows his heart to his true family as he grows up as the only human among a group of apes. Amazing Adventures Challenging puzzles and activities starring Tarzan, Terk, Kala, Jane, and the other characters from Disney's Tarzan. Features beautiful color artwork throughout. Includes beautiful full-color artwork from the movie.